Our family room has quite a large fireplace and hearth. While the brick was attractive, it needed brightening up. I like the texture and look of brick and didn’t want to paint a thick coat on top to hide it. I wanted to enhance it. I started to think of the brick houses that I love. Those that have been painted white and left to distress through the years. I love those homes! So, I thought that this look was what I should try to achieve. 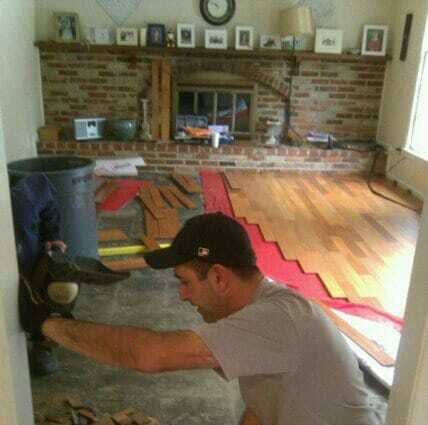 My husband first installed new wood floors. Again, you can see how dark the room is. After the floors, I decided to just dive in. First, I painted the mantel in white, distressed and waxed it. Then, on to the brick. I was hoping I’d like the result because I would be stuck with it! I made a wash with Annie Sloan’s Old White chalk paint and water. Here it is being applied. As you go along, add or remove wash to create an even look and make it as strong or light as you wish. Oh, my. I think I like what I see! And, I LOVE how it turned out (really, thank goodness)! I also painted the dark beams white. This also really brightened up the space. The before and after is truly amazing. The room is now bright and the mantel really pops. I adore the farmhouse, distressed look. My thrift store finds are perfect in the space. Oh, what paint can do! It turned out beautiful and has me second guessing my having painted my brick PURE white!!! Oh I am SO going to do this next time my husband goes out of town. It came out great!!! Hi Jesse, I actually just dipped my brush and saturated it in water, then dipped it into the paint and haphazardly brushed it on. If it looked too thick in one place, I added water to my brush and went over it again. Cheers! Thank you for your ideas. I love them! Atelier be, de Beauchêne et Cie.
What an incredible difference! Well done, it looks beautiful! Did you wax it or leave it natural? I left it natural. Thanks! Inspired! What percentage of paint to water did you use? I love how this turned out! Would you mind sharing your mantel technique? What colour of Annie Sloan paint did you use? I love how some areas are more opaque than others. The contrast is beautiful. I am planning a fireplace transformation myself. My stone it grey. I am wondering it I should go cream to warm up the colour a bit? Any suggestions? Hi Amber, I used AS Old White. I watered it down to a wash consistency and took a very wet brush to apply. I think that the white over grey will look amazing. Cream may have a bit too much yellow hue in it for the grey. Try a tiny spot first in a corner and go from there – good luck!! Thank you for such a speedy reply. I am hoping to do it today! I am so excited. I have been wanting to do it for a long time. Did you use approximately 50:50 water to paint? I basically saturated my brush’s bristles and dunked it into the wash (pretty watered down like 50/50). As you go, step back and you can either add more wash or take off with a rag to create the look you want. Good luck and let me know how it goes! pretty! 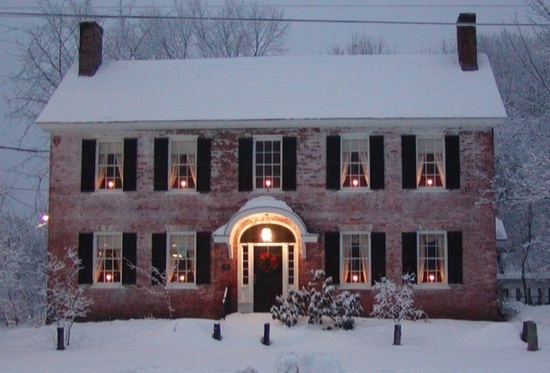 i love whitewashed brick- that exterior is dreamy! That made such a great difference. I couldn’t tell that there was a mantel until you painted it white. That made such an update! WOW…don’t know what else to say. this is amazing~ thank you for showing us your tips and tricks. Beautiful job!! I was just about to pay $3,500 to have stone put over my old brick…until I came across this! I have really large black stains from the fire smoke across much of the top of my fireplace. Do you think the chalk paint will cover them? Also, do I wash and/or wire brush the brick before painting? So excited to get started!! Already ordered the paint 🙂 Oh….and my husband is thrilled that I’m spending about $100 instead of $3,500!!! Thank you!!!! You can clean the black smoke stains by using spray bathroom cleaner. Cover the hearth & screen with old towels. Have a bucket of water ready. Spay on the cleaner and it will immediately begin to break down the black stains & smoke spots. Wipe off the bubbling dirt on the brick until you are happy with the clean results. Let it dry and see if you want to go after it again. I had a wire brush ready but never used it. Wipe up any area that had drips or over spray. I could not believe how long I lived with darken brick above the fire box when this cleaning project took no more than 15 minute to solve. I would do this before painting the brick for sure. Thanks for the great tip on cleaning the brick. It sounds pretty easy and I’m glad it worked for you. My brick wasn’t dirty at all. In fact, I only had to sweep it before I whitewashed it. I love the result and did it to brighten the room and make it a beautiful focal point instead of a dark wall of brick. I’m thrilled with the result and am glad you are with your brick too! Hi Amber, I just stumbled upon your website today while looking for some new inspirations for my company, Brick Transformers. I love the results of your fireplace and have to say, I am very impressed. I have personally refinished many hundreds of fireplaces and really like the work you have done and the look you achieved. If you have a chance, I’d love for you to check out some of my work at http://BrickTransformers.com. Have a great day. Did you need to prepare the brick in any way, first? Our fireplace has some black residue directly above the doors. I have purchased a brick cleaner, but just wondering if I should use it? Thanks so much! BEAUTIFUL fireplace, btw!!! Hi Becky, I think you should go ahead and clean off any darker residue on the brick. Since it’s a wash, anything under it peeks through. If you don’t want it to be darker in that spot, it needs to be the same color as the rest of the brick first. I didn’t have any residue on my brick to clean. I just quickly swept them a little to get off any dust, etc. and applied the wash. Good luck to you! I’m sure it will look gorgeous when done. I love mine. It was the easiest project that has made the most impact in my room. I’m chuckling at how a few of the women have the same problem as me….convincing Hubby that painted brick can look amazing! Can’t wait to show him your pictures…he’s out of town, and normally I feel it’s easier to ask for forgiveness than permission, but this just seems a little too permanent! Thanks for the inspiration! 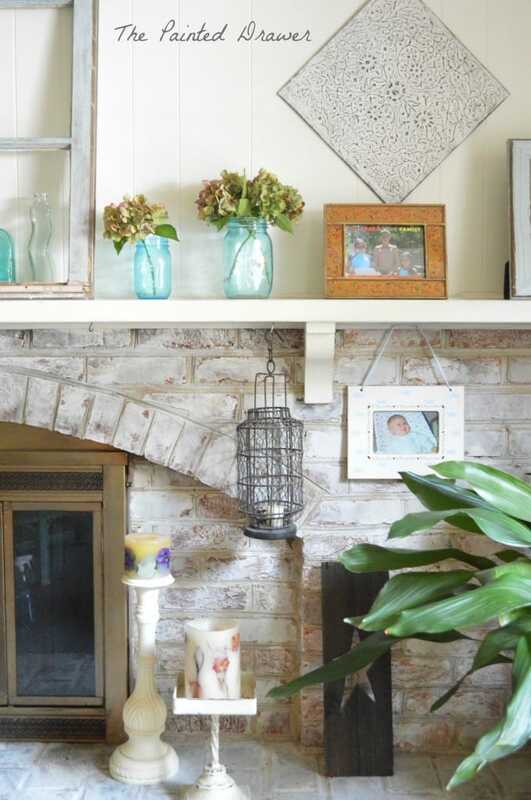 Suzanne, I just love this and am hoping you can help me with my pink brick mantel – I’m stuck on what color to white wash with – I really don’t want to see pink at all, I’d love to tone it down to a gray sand on the warm side….any suggestions. I guess my confusion is to I use white, off white, ivory???? I just found you via link party and WOW. So beautiful and simply transformations. Your videos are great. PLEASE answer me on how you did your Family Room Beams? Hi Laura, thanks so much! I actually did my beams the old fashioned way – primer and paint! They took two coats of white primer and then two coats of latex (Benjamin Moore Cloud White). It was a labor of love! They were a really dark brown and it took that many coats to cover. I painted the ceiling in between also. This I did in an off white (Benjamin Moore’s Muslin) to give it contrast to the white beams. One tip is that as soon as you paint them, all of the spaces between the beams and ceiling will show. Get a good caulk gun. I ended up using quite a bit. Thanks again and good luck with your project! Thank you so much for not only sharing this with us, but your patience in fielding questions. 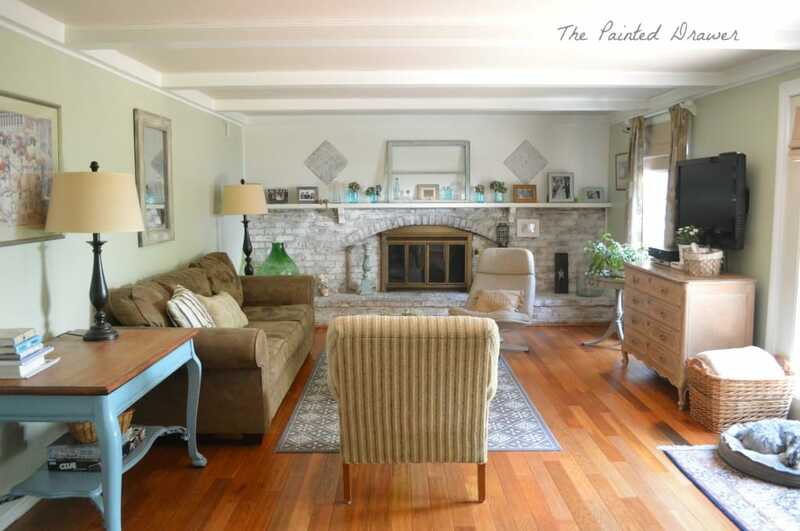 My mom and I are truly inspired and would like to tackle this project with her all-white brick fireplace. I was thinking we could add color using Annie Sloan paints and then white washing over the top. We were thinking of adding 2 or 4 parts Old White to Provence (http://www.anniesloan.com/acatalog/Provence_profile.html), Scandinavian Pink and Duck Egg Blue to paint the bricks randomly, fading in and out to make them as natural looking as possible, then using your white washing technique over the top. Do you think this a good approach or?? If we do this, would we need o sand anywhere in the process. Should mortar remain white? Also, did you use a special brush? No sealer or wax? Hi there!! What kind of brush(es) did you use? It looks so pretty!! I used regular paint brush from Home Depot – the kind for all types of paint. Don’t forget the rag! You will need this too! This is so beautiful! Did you paint over the mortar or just paint the bricks? I applied the wash over both – thanks so much! I just white washed my orangey brick and it has a pink hew to it…have any suggestions how to tone that down? the paint people at the store were stumped. You did a wonderful job, thank you for sharing. What color did you paint your mantle and is it a semi gloss? 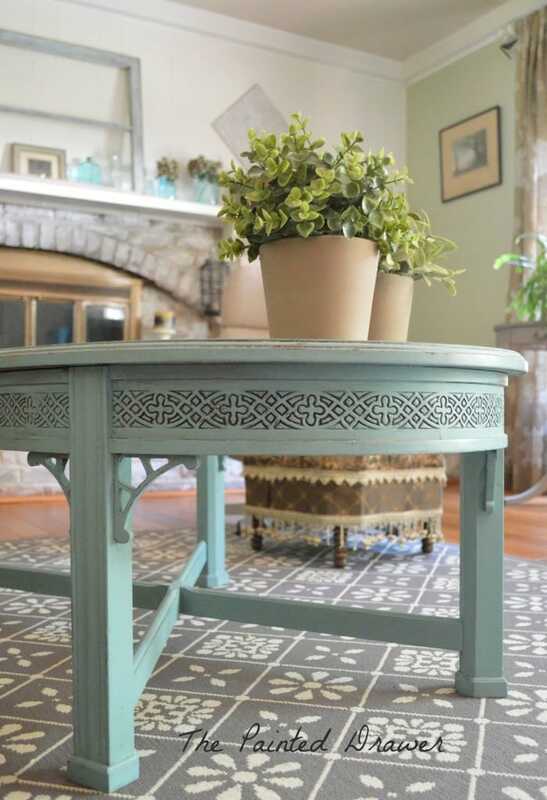 Where can I purchase Annie Sloan chalk paint? Thank you for being so kind to answer all of our questions. Hi Cindy, the color is Cloud White from Benjamin Moore and yes, it is in semi gloss. You can purchase Annie Sloan paint from your local reseller. You can find one on her website. Thanks! Perfect! Thank you so much, you have been a huge help. What did you paint muslin? Hi Suzanne, I LOVE your version of white wash for the fireplace. Too many pictures/tutorials that I have seen make the white wash appear like a “white film” covering the bricks and that is definitely not the look I am wanting to achieve. I like the distressed look which seems to be what you did to your fireplace. I am in the midst of having painters paint the bookshelves on either side of my fireplace-they are oak and it has taken me a couple of years to convince my husband to have them painted. 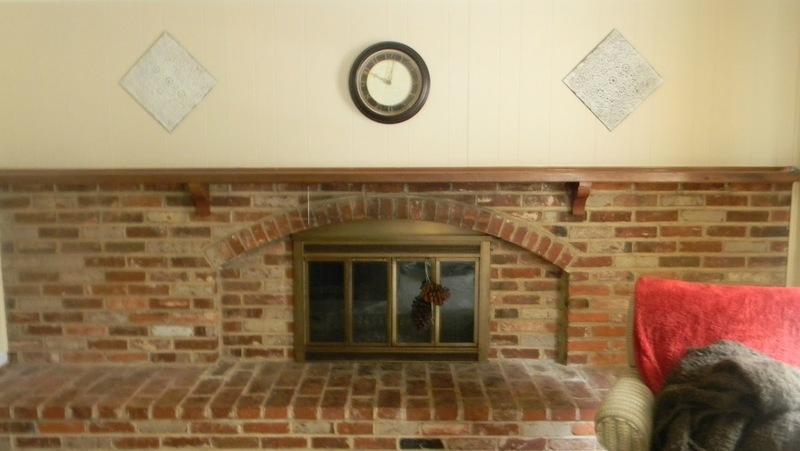 I wanted to white wash the fireplace BEFORE they painted but my husband did not want to do anything with the brick fireplace. Now that the bookshelves have been painted (BM White Chocolate-creamier than white) it agrees that the fireplace needs something done to it for a more updated look. I probably could tackle the job myself but I am hesitant since the mantle and bookshelves have just been painted. The bricks are a pinkish/salmon color and I don’t want them painted the same color as the bookshelves-I am wanting a contrasting color. Most of the colors in my home are gold, rust, greens with alot of oak trim (restained a mahogany color). I tend to go for the warmer colors since my home was built in the 80’s and I don’t intend to live here longer than 5 more years. We are also having our oak kitchen cabinets restained a dark mahogany-I wanted them painted an off white but the professionals suggested restaining since they are Kraft Maid cabinets and in excellent shape. Can you please give me some suggestions for the fireplace color that would compliment the creamy (not yellow) bookcases? I am assuming the painters will use a BM paint for this also. Thank you so much for your advice. The brick looks gorgeous! Any thoughts regarding use of AS Old White over red brick? Thank you! My brick was actually quite red to begin with and it covered really well. IF you click on the post again, I’ve added a few “before” shots and you can see. Thanks! I love the brick and intend to use your tutorial. I appreciate your time. The only thing I would do is take that brass fireplace screen out and paint it. Rustoleum has so many wonderful colors to choose from. Hammered, oil bronze etc. Glad you are able to use the tutorial and I wish you the best of luck with your project. I happen to really like the brass screen so all is well. Cheers! I have just dicovered AS paint and love it. Your fireplace is exactly what I have been looking for and I plan on trying it. Did you cover the paint with anything when you where finished? Wax or laquear ? Thanks! Hi Tracy – no, I did not seal it and it has been about four years now with no issues. I didn’t want to wax or poly brick as its super porous and I didn’t want any sheen on the brick plus I was nervous as it the fire may not really react well with the sealer! Thanks and best of luck! I have paneling above the mantel as well as in my entire study. I happen to love the look of painted paneling and I’m sure yours will look great! I used a brush to dab it on with my bristles soaking wet and a rag (old t-shirt) to dab it off as I went along. Kind of eyeballed it every few minutes to take off/add on as needed. Best of luck! Did you you AS Old White Chalk Paint or Wall Paint? Thanks! Your transformation is beautiful! 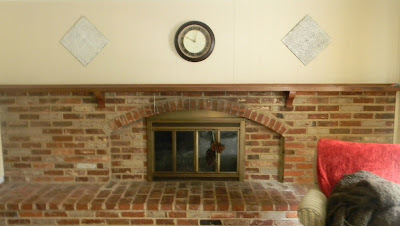 I would like to paint my oak fireplace mantel and am curious as to why you did not use chalk paint on yours? Thank you! Hi and sorry I am just getting around to replying to your question. I only used the one application of the wash. It was actually really very watery and just soaked right into the brick and mortar. I didn’t do anything different around it at all and it just ended up looking like this. Best of luck with your project! I have AS old white here. I totally want to do this. Do you thin I need to seal it some how? I’m wondering if over time with usage, people sitting on fireplace bench part or dogs walking on it etc. if the finish will be removed??? I use AS a lot but always seal it with wax or a poly of some kind. Brick obviously is entirely different. How has yours worn? Just worried it’ll come off without a sealer of some kind. Hi Hannah, I did not seal mine and it has held up now for 3 years. It really is soaked up by the brick and there is no need to seal it. It won’t come off as it is absorbed. You likely shouldn’t use wax or a poly on any surface near fire or heat. Best of luck! Beautiful! Any suggestions on how to texturize it? My fireplace is a flat shiny brick, with no character. Was thinking about sponging some white mortar, then using your technique. Hi Lisa – I would suggest maybe using a few different color washes on it. Start with white and then maybe add a warmer cream, etc. to see if that works. I have a video tutorial on how I painted my bathroom linoleum floor and it is similar to what I am thinking. Just an idea. Best of luck! Hi Kathy, you only need one quart of the white. Good luck! Hi there! I know this is an old post, but I have to ask…in your original blog post, you said you diluted the paint at a 1:3 ratio of paint to water but in the comments asking how much you diluted the water, you said a 1:2 ratio. Do you remember which one it was? Hi Sarah, honestly, it is easiest to take your brush and dip it into a bowl of water and then dip it soaking wet into the paint and apply. Don’t even bother diluting the paint as it isn’t really necessary. I have done quite a few since this one and just dipping your soaking wet brush bristles into water is the easiest way. Best of luck!